An electric or battery powered grass trimmer can be great for maintaining a well-kept lawn, but there are some safety issues that users should bear in mind. Safety features are built into modern grass trimmers like with the GT Revolution 20V 12” String Trimmer/Grass Edger/ Mini-Mower. However, you still have to know how to operate the machine correctly and make sure to take all proper safety precautions. 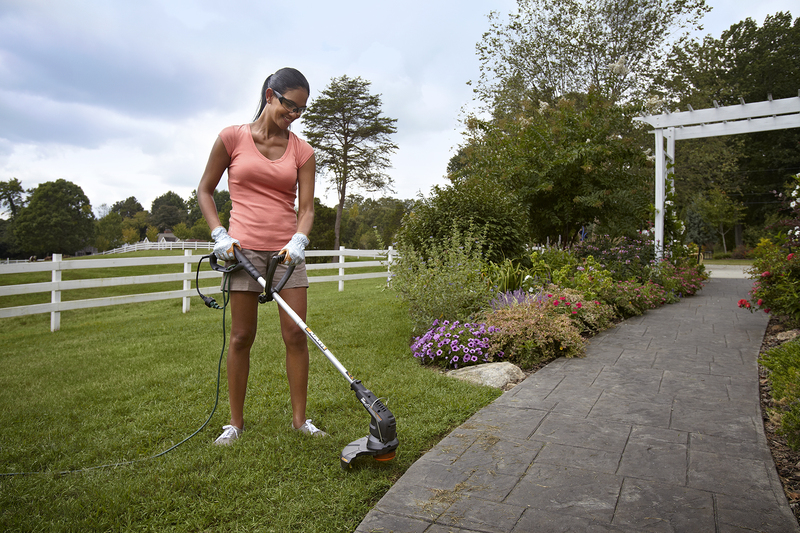 Here are a few grass edge trimmer safety tips for DIYers that are getting ready to start their summer yard care routine. They include wearing the right gear, using protective equipment, operating when the weather is right, clearing the area to be trimmed, being wary of others around you, using compatible accessories, and maintaining your battery powered or electric grass trimmer. Summer is hot, so most people prefer wearing things like shorts and sandals when they go out to do yard work. This might be fine for some jobs, like weeding or watering the plants, but you need to wear protective clothing when operating an electric or battery powered weed wacker. The string spins rapidly and can kick off a lot of debris. When you go to use your grass edge trimmer, wear long pants, footwear with a closed toe, gloves, and a long sleeve shirt to prevent getting scrapes. In addition to wearing the right clothing while using your electric or battery powered string trimmer, you will also want to use the recommended protective gear. At a minimum, you want to use eye protection, but you should also consider earplugs and a face shield. Some of these items might be uncomfortable, but it’s worth it to protect against injury. You should avoid using an electric or battery powered weed trimmer in wet weather. To start, these conditions can put added stress on the motor, shortening the operating life of the grass trimmer. Furthermore, wet grass can be slippery, and it can be difficult to maintain your balance when holding and working with a tool on wet turf. Even a simple slip can result in injury, so it’s better to wait for good weather before using your electric or battery powered grass trimmer. The main safety concern when it comes to operating an electric or battery powered string trimmer is its potential to throw debris. To reduce this possible risk, you should walk the work area to look for any debris that could be easily thrown by the tool. You might not be able to find and remove everything, but you can limit the chances you’ll be injured. If and when possible, keep others out of your work area. Even the best battery powered weed eater throws scraps, and it can be a risk to the operator and any nearby person. If you have children or pets, keep them inside while you use the grass trimmer. If someone enters your work area, stop the tool and wait for them to leave before resuming your work. Every electric and battery powered grass trimmer is designed to work with string of a specific thickness. If you use string that is too thick or too thin, it can be hazardous. Check your manual and only use the recommended string for the grass trimmer you own. Most electric and battery powered weed trimmers are only designed to work with a cord, but there are some that can take an edging blade. However, you do not want to try to use a blade on a model that was not designed to take one. If prefer to trim grass and edge with the same unit, it is safer and easier to use a model like the 56V 13” Cordless String Trimmer & Wheeled Edger from Worx. This battery powered grass trimmer/edger has a head that pivots, and even has wheels that make it easier to control while you edge. Each time you take out your grass trimmer, you should give it a quick inspection to make sure all of the parts are still in good working order. When you are done using the machine, you should clean it thoroughly and put it away properly. If you have a gas-powered trimmer, you want to make sure to store it so the fuel does not leak. Additionally, you should avoid leaving gas-powered models in enclosed spaces with poor ventilation. When used properly, electric and battery powered weed wackers are very safe. You just need to wear the right protective clothing and gear, and take some safety precautions to prevent injuries either to yourself or others. Make the job of trimming and edging easier with the perfect tool. Shop WORX today for your new grass trimmer. Wearing the right gear, using protective equipment, operating when the weather is right, clearing the area to be trimmed, being wary of others around you, using compatible accessories, and maintaining your battery powered or electric grass trimmer.